Most Australians have never visited the Murray River, and even fewer know that it ends in a vast and shallow freshwater lake. The freshwater lake is separated from the Southern Ocean by 7.6 kilometres of barrage that were built in the 1930s across the five channels that converge on the Murray River’s sea mouth. The barrages dammed the estuary and the artificial lake now sits almost 1 metre above sea level and covers an area of about 650 km² (250 mi²). This artificial lake is so vast that you can’t see from one side to the other, and it evaporates the equivalent of about two Sydney Harbour’s full of freshwater each year. It is full of carp, a pest fish introduced from Europe. Before the barrages were built mulloway, Agyrosomus japonicas, were a mainstay of the local fishery. Milang, a little port on the shores of Lake Alexandrina was home to a hundred mulloway fishermen who routinely sent off several hundred tons of fish to the Adelaide and Melbourne fish markets. Back then the central basin of the wave-dominated barrier estuary was sometimes full of freshwater and sometimes full of salty water, the nature of the mix depended on the tides, the winds and Murray River flows. The position of the channel at the mouth is governed principally by the ocean… During the great 1956 flood, the highest ever recorded on the lower Murray, the river outlet, although wider and deeper than normal, was situated in the easterly section of the overall movement pattern and was in a similar position as the situation of the mouth during the dry year of 1914. However in April 1938, during a violet storm the mouth doubled its width in a few days and a great deal of sand at the western extremity was washed away. Within two months the channel had narrowed and when surveys were carried out 12 months later the position of the outlet was in almost the same situation as before the storm. During this period there was no great fluctuation in the volume of fresh water coming down the river. Murray River flow was usually good in spring, but by mid summer it had often slowed and if conditions were calm a sandbar would quickly form and sometimes block the Murray’s sea mouth. Then usually by March a south westerly wind had picked up. The old fishermen say, that at that time of year the mulloway would hangout in the underwater canyons beyond the Murray’s mouth, as though reluctant to come in. Then on the big tides, always with the full moon, large schools would race through the Murray’s sea mouth. The year the barrages were sealed, the mulloway came in and then were trapped, on each ebbing tide, churning in the channels below the barrages. There is an old photograph of the Goolwa wharf groaning under 160 ton of dead mulloway. Now the dominant fish species in Lake Alexandrina is the pest, European carp, Cyprinus carpio. This is a freshwater species, it wouldn’t exist in the lake except for the barrages that dammed the estuary and stopped the tide. Hundreds of tonnes of carp are commercially harvested every year from Lake Alexandrina and much of what is not used for cray bait or human consumption is converted into the plant fertilizer, Charlie Carp. The commercial carp fishery in the Lower Murray in 2008/2009 was reported as 792 tonnes worth A$863,000. The local commercial carp fishermen, including Henry Jones, are very outspoken about the need to increase freshwater flows to the dammed estuary. But of course they never say, “dammed estuary”! Rather they pretend that the water is for the environment. They pretend that they are doing their bit to get rid of the carp by commercially harvesting them. In fact, if the estuary was restored and the Southern Ocean allowed to roll-in each autumn as it once did naturally, there would be no carp fishery because there would be no carp: they would be flushed out to sea with the tides. Instead, as part of an on-going and misguided environmental campaign, ostensibly about water reform in the Murray Darling and, in particular, the need for more water for the “Murray’s mouth”, the Australian government has legislated a new Basin Plan. So successful has the campaigning been that the freshwater allocation for Lake Alexandrina will continue to increase, and at no cost to carp fishermen. The cost is in fact being wholly born by the Australian taxpayer who, via the Murray Darling Basin Authority, with $10 billion of your hard earned cash, is buying irrigation licences from farmers to send the freshwater down the river to Mr Jones and the European carp. 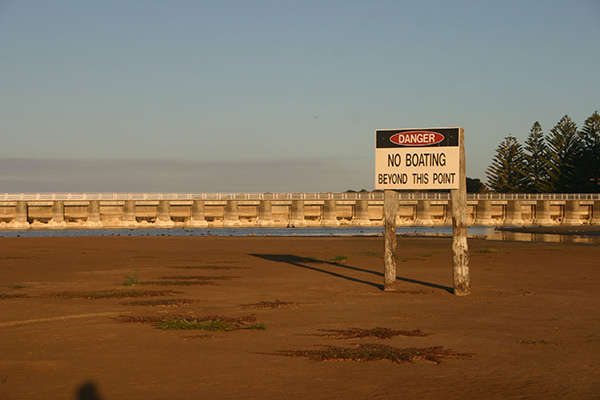 Indeed Australians have been badly mislead into believing that by taking about 1/3 of all the water used to produce food in the Murray Darling Basin and sending it down the River, the sea mouth of the Murray River can be kept open 90 per cent of the time. In fact the tides of the Southern Ocean could scour the mouth of the Murray, at no expense to Australian taxpayers, if only the Murray River’s estuary were restored. It is no secret that much of the water bought back from irrigators will be sent down to the dammed estuary. But it is just not reported that the estuary is dammed or that there is not much natural environment left in or around Lake Alexandrina: that in effect the environmental flow is being delivered to a carp fishery surrounded by farmland and new housing estates. Of course if the estuary was restored the mulloway would come back. And the mulloway fishery can exist independently of freshwater environmental flows at the expense of food production. The mulloway fishermen harvested nature’s natural bounty. What a sham and what a pity, given this environmental water could be used to water natural wetland further upstream or even to grow food. Australia must be indeed a rich country if we can afford to spend $10 billion dollars subsiding a carp fishery.